Detailing the physical features, habits, territorial reach and other identifying qualities of the Margined Blister Beetle. The Margined Blister Beetle is as black as night, which showcases a thin white line that runs down the middle of the elytra. 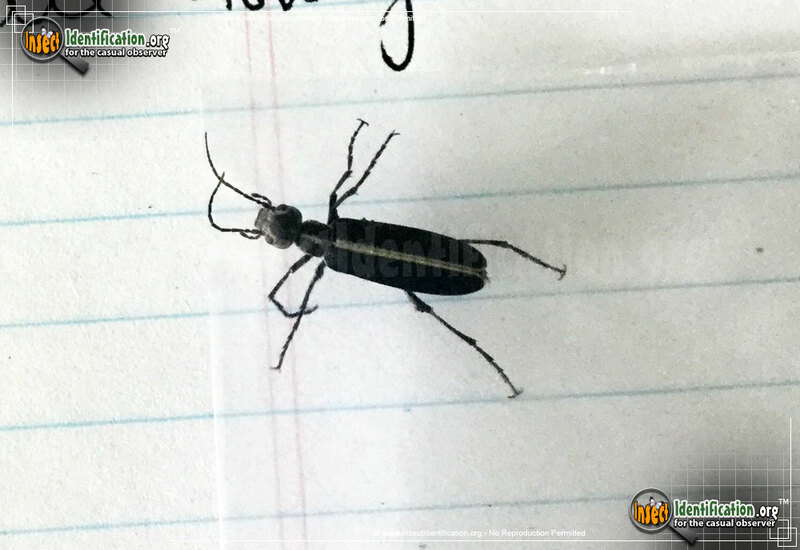 Slender and somewhat plain, the Margined Blister Beetle is a matte black with a pale white line running down the center of the body. Flat mouth parts and a square-shaped head are connected to the abdomen and wings by a narrow neck. Antennae and long legs are black. The Margined Blister Beetle can secrete a chemical called cantharidin when threatened or smashed. This secretion causes blisters to human skin and can injure an insect predator. This beetle feeds on plant tissue so contact with potential enemies is likely for those working in crop fields and backyard gardens. They are able to fly and sometimes land on arms or necks where they are swatted at or even crushed, releasing the blistering agent. Blisters may form immediately and continue to grow in size and redness throughout the day. Look for Margined Blister Beetles on the leaves and fruit of tomato, beet, eggplant, potato, and alfalfa plants. It can become a garden pest in large numbers when chances of encountering them increase. Handling individuals is best avoided.